Citing sources familiar with the matter, a report on Thursday morning claims that LG Display will be delivering between 2 million and 4 million OLED panels to Apple for use in a future iPhone. If accurate, this would start to put a dent in Samsung's supply dominance of the panel for Apple, giving the iPhone producer an option for the future —assuming LG can ramp up supply sufficiently. 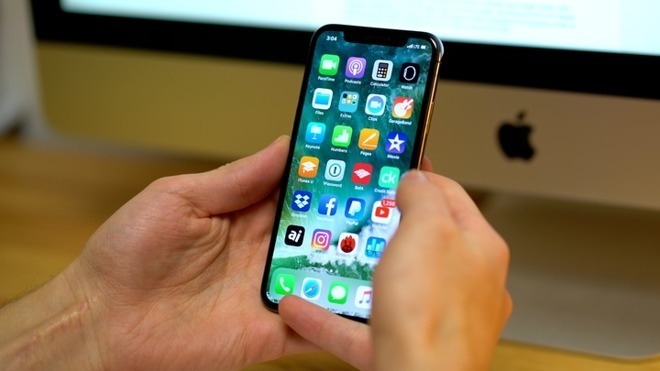 "Securing a second supplier for OLED screens is crucial for Apple as it will allow the company to reduce its reliance on Samsung, which is currently the sole supplier," said Jerry Kang, a senior principal analyst at IHS Markit told the South China Morning Post. "At the same time, it will help accelerate a broad adoption of OLED screens. More suppliers means more volume, and in turn, lower pricing." If the numbers are correct, and the delivered panels are intended for this year, only a handful of 2018 iPhones will have an LG-supplied screen. The panels may be held back for a future device, when enough of them are accumulated. In January, LG was expected to ship between 15 to 16 million OLED panels in the second half of 2018. That contrasts sharply with iPhone X panel supplier Samsung Display, which is thought to be churning out nearly 10 million units per month. "Regarding the OLED supply deal for Apple's iPhone X, nothing has been set in detail," LG wrote in a regulatory filing in December 2017. "When anything is confirmed in detail, we will announce it, or [otherwise an announcement will be made] in a month." Earlier in July 2017, it was rumored that Apple pumped $2.7 billion into LG as an advance payment for OLED panels. At the time it was thought that the order was for panels shipping in calendar year 2019, but it could be that the terms —and LG's ability to deliver —have evolved. At present, Samsung is the exclusive supplier of OLED panels for the iPhone X, being the only firm with enough production capacity to meet Apple demands. Samsung has been using OLED panels it makes on its phones for years, including curved ones on devices like the Galaxy S8. The three iPhone models currently speculated to arrive this fall include two models with OLED screens measuring 6.5 inches and 5.8 inches, while a third is equipped with a 6.1-inch TFT LCD. Most sources now claim that all three will have the TrueDepth camera array and use Face ID, but the LCD model will be singled out as a cost-effective model while the OLED versions will have more premium pricing and specifications. The LCD model is expected to cost between $600 and $700, with the so-called "iPhone X Plus" again hitting $1000 and up.